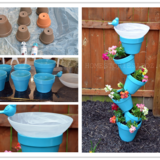 When it comes to DIY projects involving dishes, we have to be honest that we’re not necessarily all that skilled. 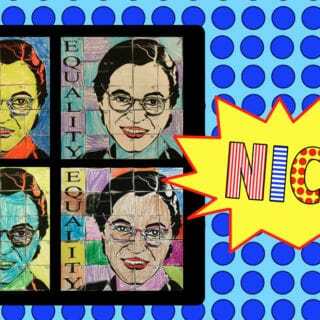 By that, we mean that we don’t have much experience with glass blowing, pottery, or porcelain work. 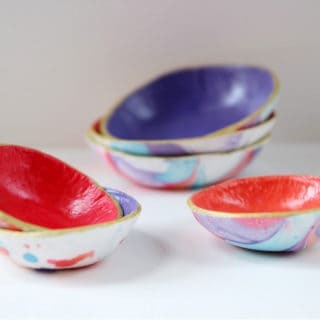 Perhaps we’ll have the opportunity to learn more about those things in the future but, for now, you probably won’t find us creating our very own dish sets from scratch. 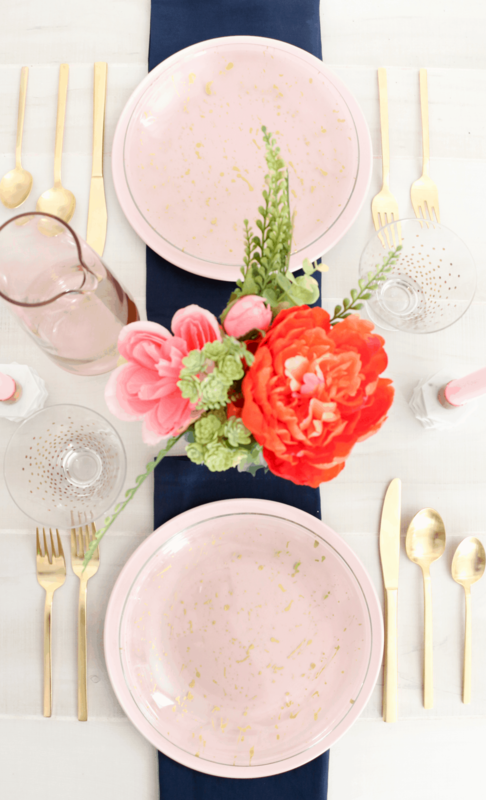 That doesn’t mean, however, that we can’t use any of our crafting skills to customize our own dishes! 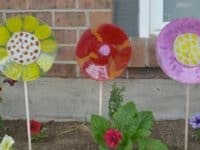 Where there’s a will, there’s a way, and our way is with different glass painting techniques! Just in case you’d like to try creating your own painted dishes as well, here are 15 tutorials, ideas, and inspiration posts to help get you started. 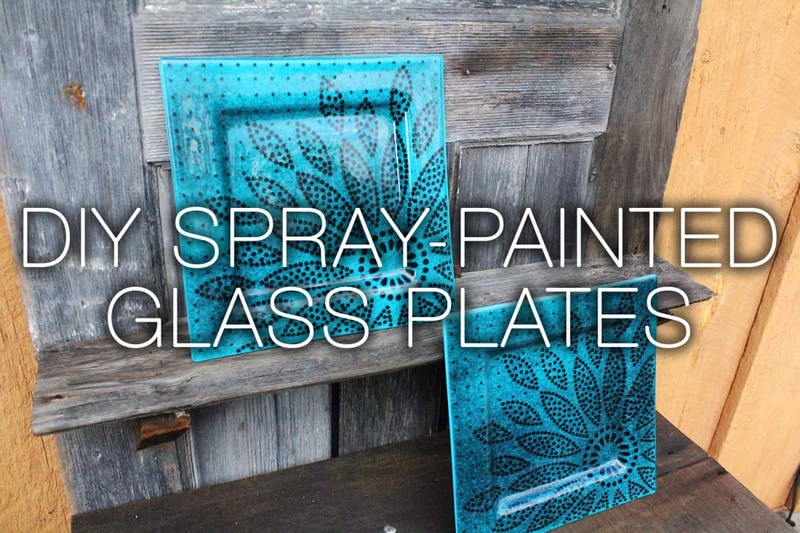 Perhaps you have a set of glass plates that you already quite like but you wish they had just a hint of extra sparkle or flare, even though you’re not actually that confident in the details of your painting skills? 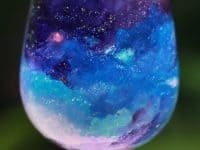 Then maybe an abstract, more creative technique is the better idea for you! 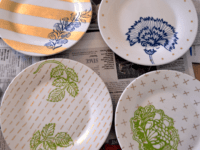 We love the way A Beautiful Mess used metallic gold paint and a splattering technique to give their plates some character. The holidays might be over for the year but, where we live, that doesn’t mean winter is anywhere near being over! 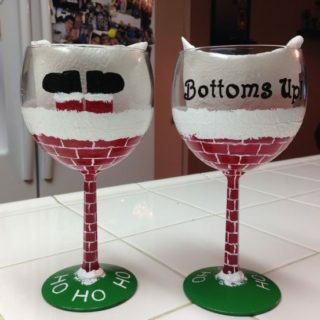 Maybe that’s why winter themed crafts and DIY projects are still catching our attention in a big way. 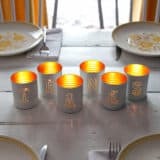 We absolutely loved the cute simplicity of these cute little paint stencilled snowflakes from My Uncommon Slices of Suburbia. Putting them around the outer edge of the plate adds a little bit of seasonal detail to each meal you serve on them! 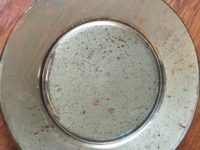 Are you completely enamoured with the idea of using metallic paint so that your design really shines, but you’re just not sure that gold really suits the rest of your dish or décor scheme? 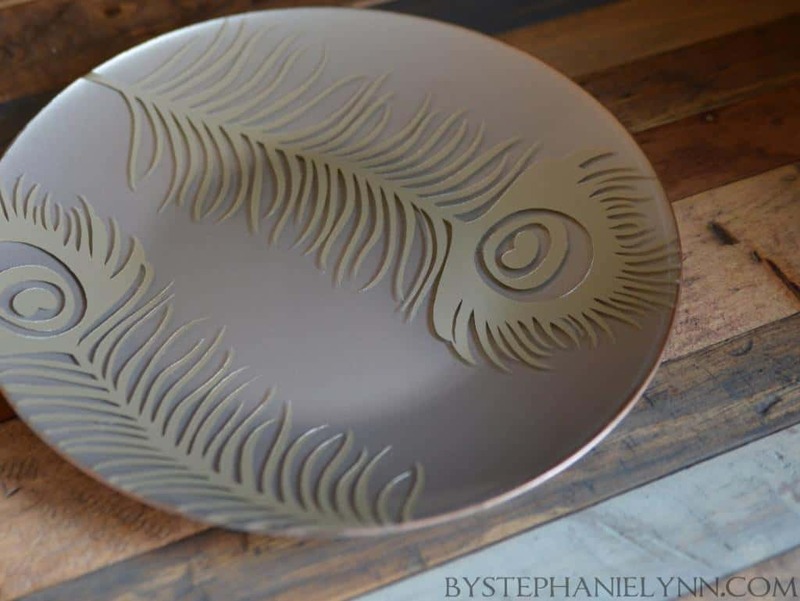 In that case, perhaps you’d prefer this adorable silver design from By Stephanie Lynn! 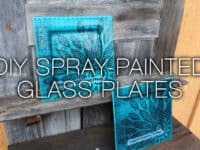 We love the way they used a stencil to get really clean lines on their stylish peacock feathers, but you could also try hand painting yours if you’re feeling confident and prefer that kind of project. 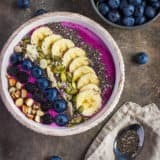 In addition to making your own dish colour scheme, would you actually like to somehow make your own dish, even though you’re not ready to start glass working? Then we definitely think you should take a look at how Cooking With Alison made a lovely cupcake platter from a plate and an old ice cream dish! 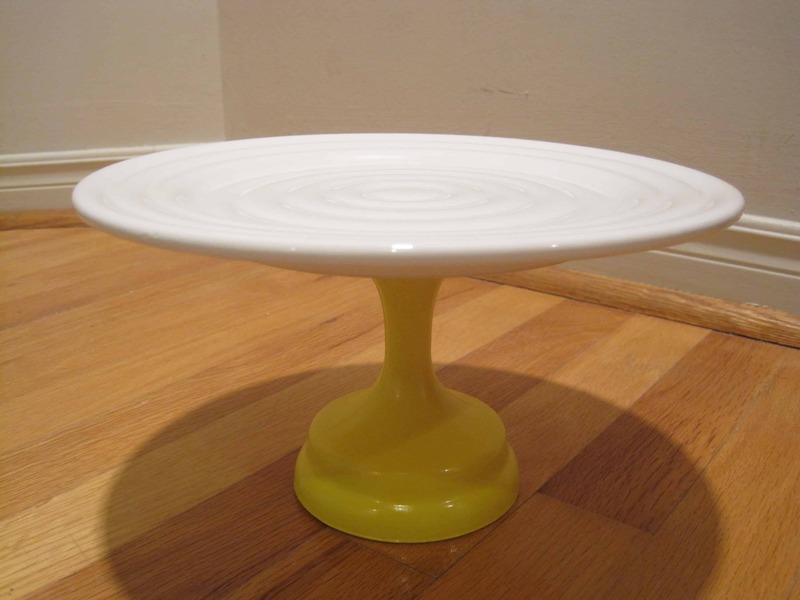 We really enjoy how vintage inspired and kitschy their combination of stark white and a pop of solid bright colour makes the piece look. 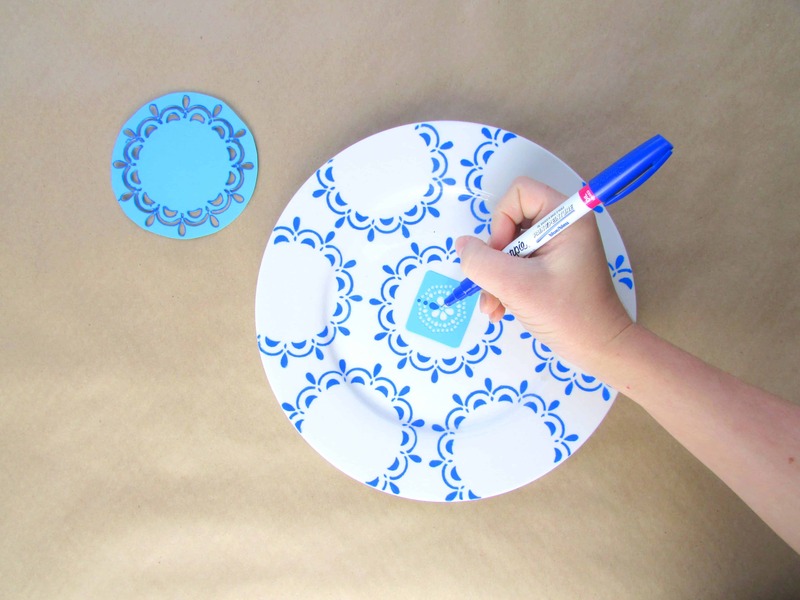 Are you very intrigued by the idea of using paint stencils to get neat shapes and uniformly repeating patterns but you find that you still make your edges a little bit messy when you use a brush? Well, if you feel more confident in your hand drawing skills, maybe you’d rather carefully fill your stencils in with a paint marker instead? 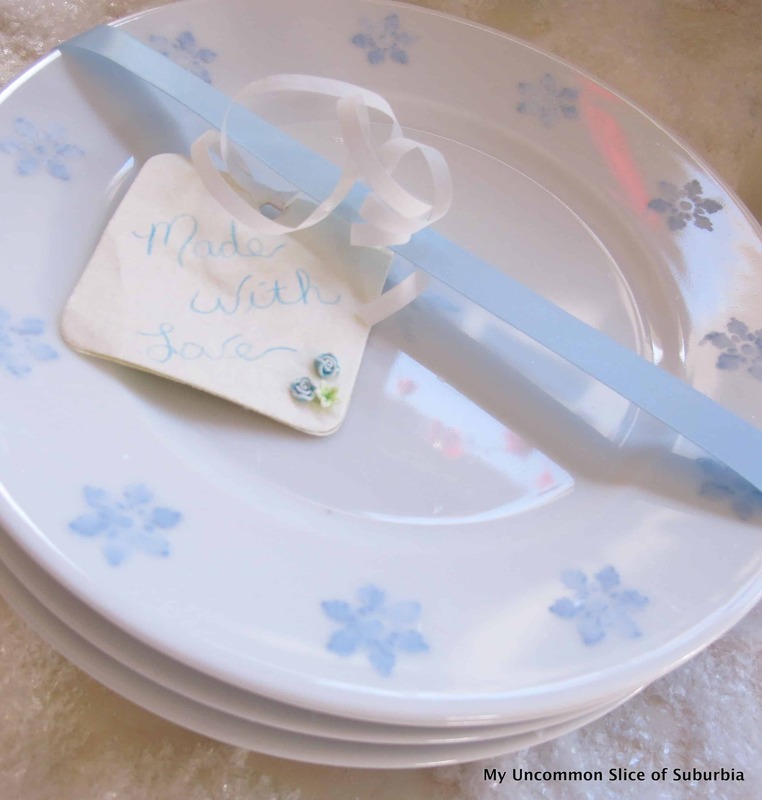 Check out how this lovely blue lacy pattern was stenciled that way by Francoise et Moi. 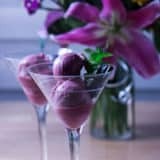 Have you really liked a number of the ideas and techniques we’ve shown you on this list so far and you’re having trouble deciding between them? Well, who said you have to choose? 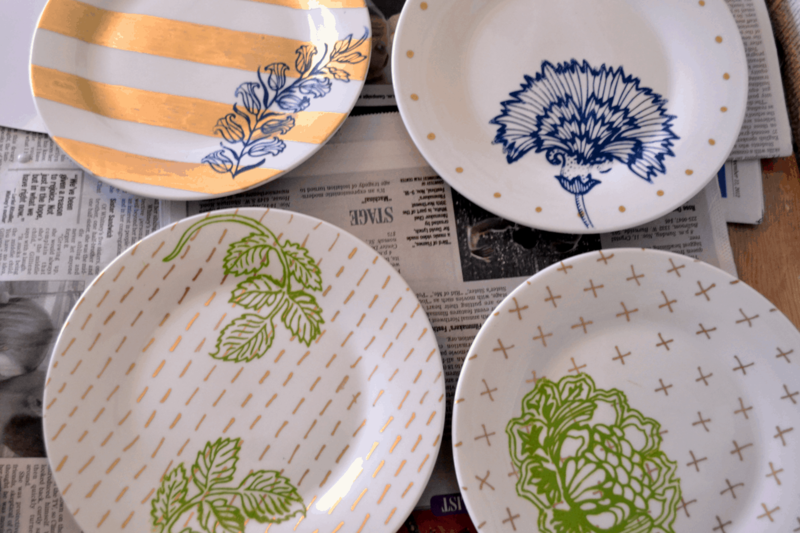 We love the idea of combining an all-over background pattern and a pretty stenciled design on one dish, just like A Home in The Making did with these plates! 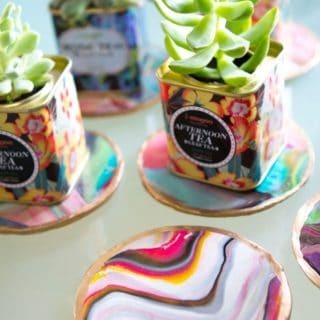 They’re attention grabbing in both their pattern contrast and their colour combination. 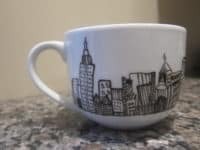 Maybe you find hand painting dishes the most fun when you’re combining that technique with a couple other crafting skills too? 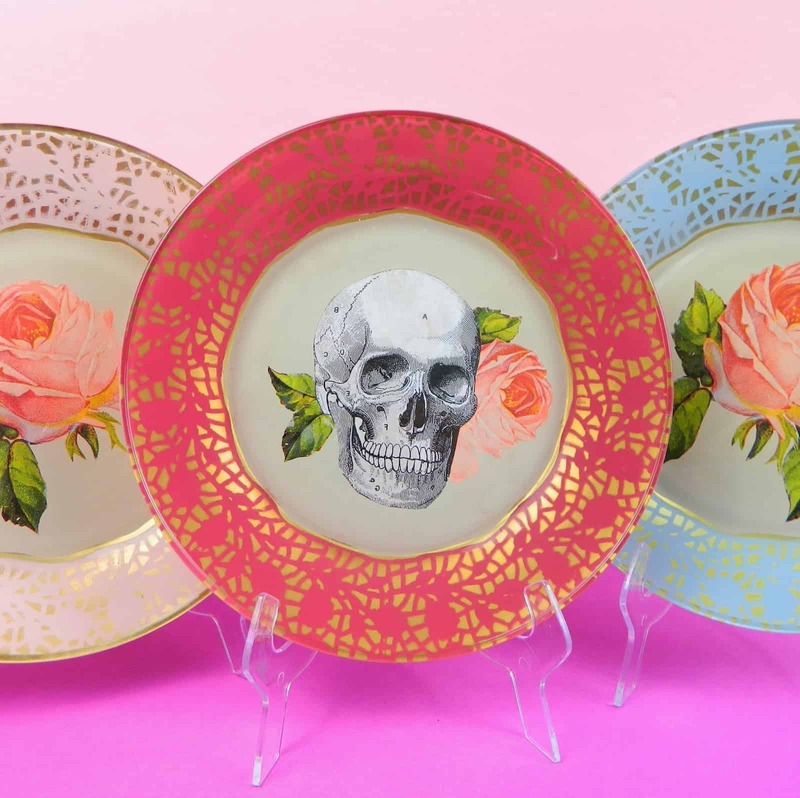 In that case, we definitely think you should take a look at how Mark Montano painted, stenciled, and decoupaged an image into the middle of these clear glass plates to really make an attention grabbing design! This tutorial shows you how to do all the crafting work on the bottom of the plate so it shows through onto the top but still leaves a clean, smooth surface for eating on. 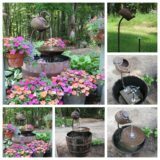 Have you always loved the way a rustic, naturally weathered design with a finish that’s a little less than flawless looks? 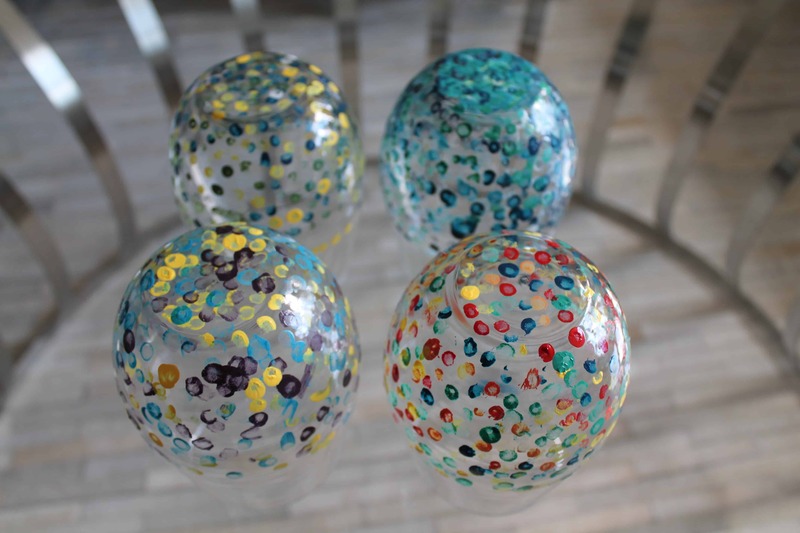 We enjoy that aesthetic as well, which is why we’ve always loved sponging and sprayed effects. It only makes sense, then that we’d enjoy this awesome spray painted plate design by Kyle Challancin! 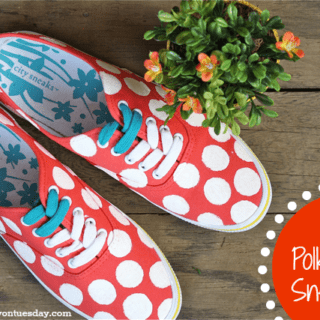 Their tutorial shows you how to preserve a pattern or image amidst the spray. 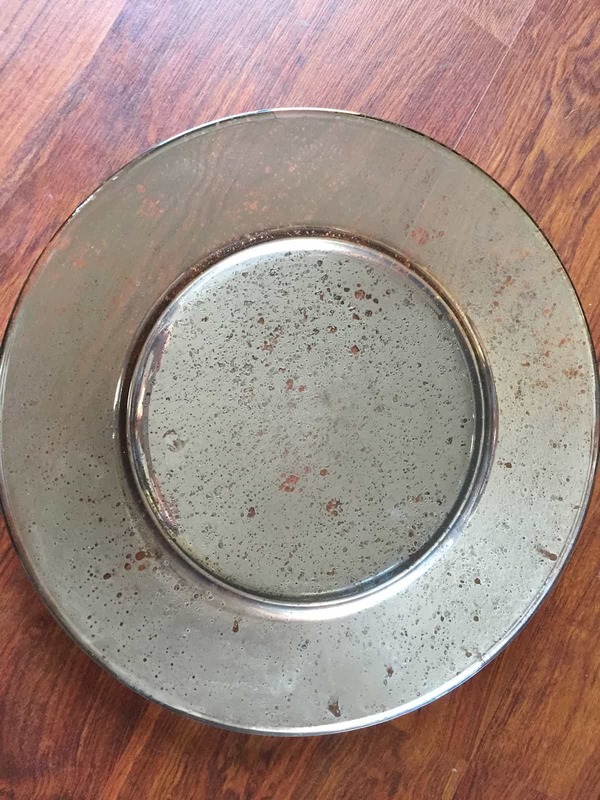 Are the plates you’re thinking of painting actually old ones that you almost gave away for donation until you realized they were an upcycling opportunity? 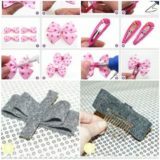 In that case, they’re the perfect tools for getting crafty using unconventional materials with your kids! 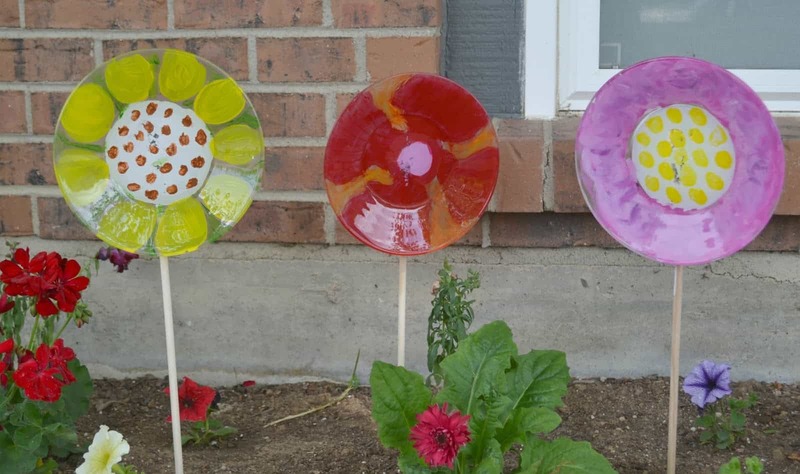 We love the way Building Our Story painted their plates like flowers and used wooden dowels to make stems so the plates could stand in the garden among the real blossoms. 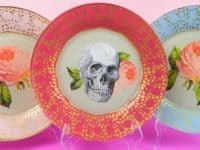 If you’re going to make yourself custom flashy dishes, would you prefer to make sure they have an extra flashy element to them, rather than just being painted? In that case, we’d absolutely recommend getting into the glitter paints! 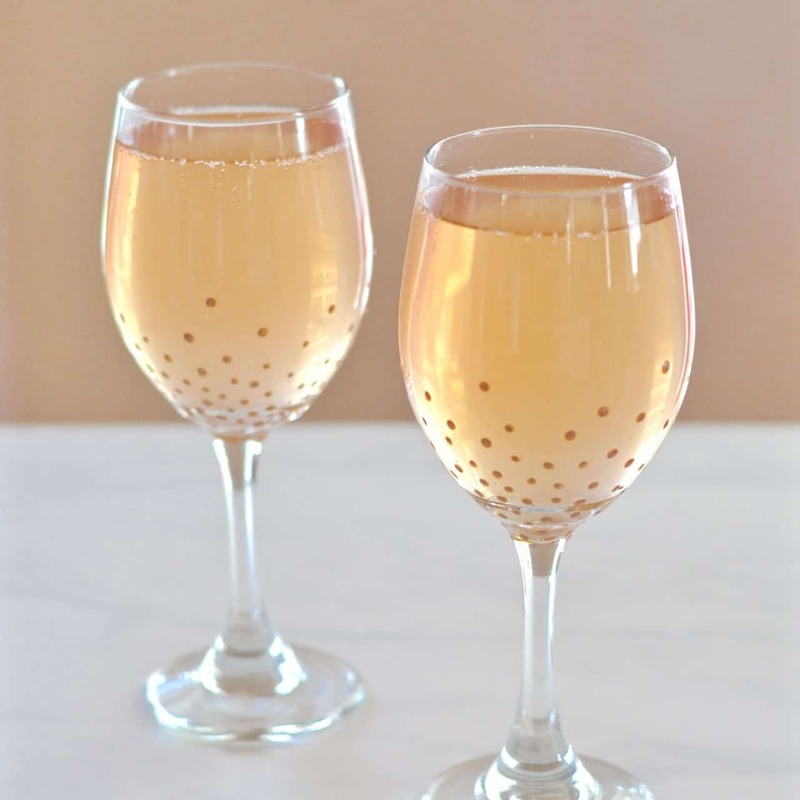 Modern and Bloom shows you how to add a simple spray of glitter to the widest point of a wine glass so you can really enjoy a nice drink with a friend at the end of a long work week. 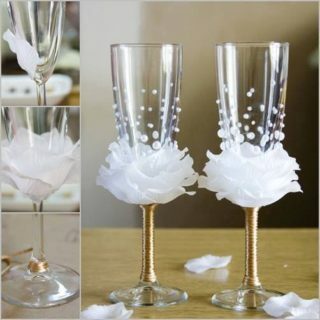 Do you love the idea of custom decorating yourself a set of wine glasses but you’re just not sure that the glitz and glam of glitter is quite the right choice for your personal or décor style? In that case, maybe you’d prefer using a technique that’s a little more hands on! 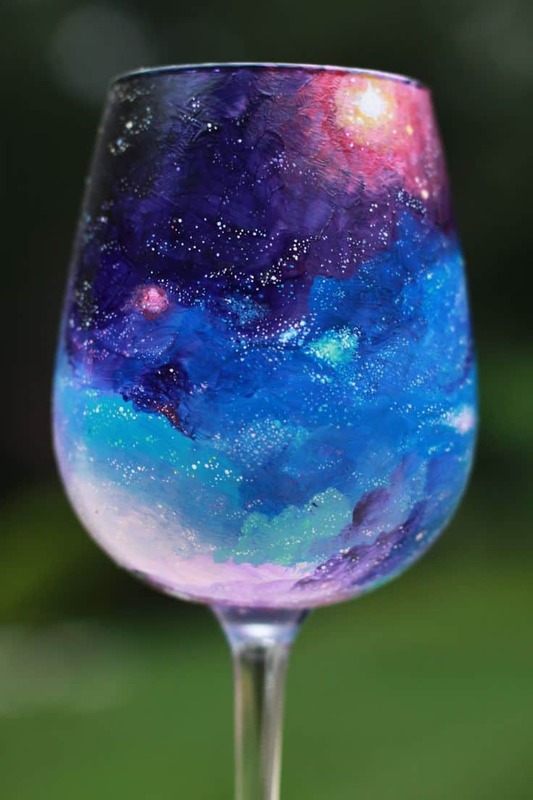 We can’t get over how awesome these spotted finger painted wine glasses from Plenty The Magazine are, especially if you create them multi-coloured! 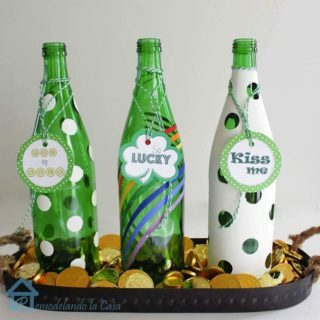 As cute as the clearly handmade crafty ideas are for your home, would you prefer to actually make your own version of a classic design that will actually look like it might have been purchased in stores by the time you’re done? Then maybe a traditionally sold effect like mercury rims on plates might be more your speed! 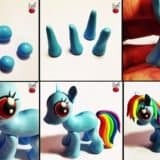 We love how straight forward and surprisingly simple this tutorial from A Sparkle of Genius is, letting you get the effect in just a few simple steps. 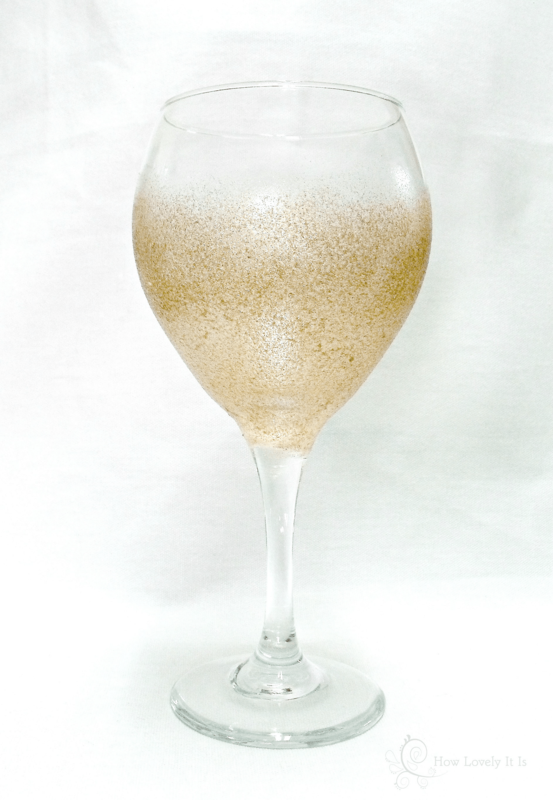 Are you torn somewhere between enjoying the gold glitter wine glasses and enjoying the spotted finger painting glasses, but you’re totally stuck when it comes to actually choosing which one to do? Well, who said you have to choose? 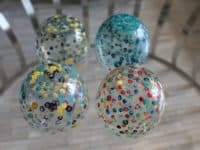 We love the way Making Life Lovely created a polka dotted pattern using metallic gold paint that has a bit of its own shine to it, so you kind of get the best of both worlds. 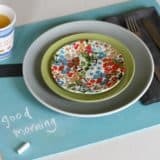 Perhaps you’ve been scrolling through these ideas and admiring their creativity, but wishing you could get creative by drawing on your dishes instead, since that’s where your real artistic skills lie? 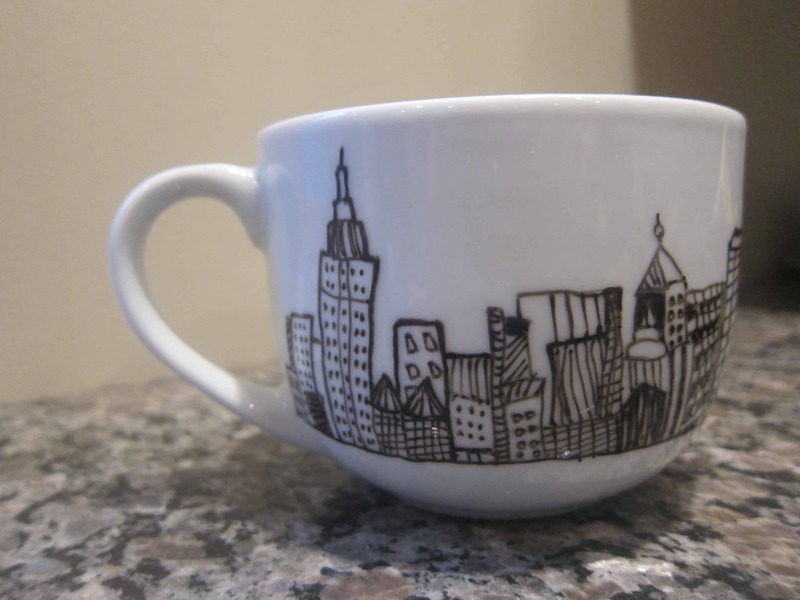 Then we definitely think you’d be a great person for creating your own marker sketched mug design, similar to what Diary of An East New Yorker created here. 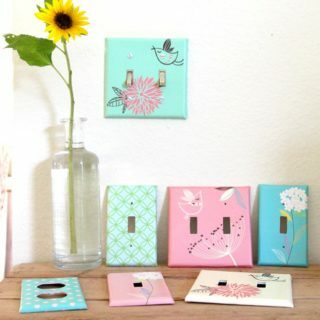 Have you always loved the way sponged on, abstract designs can be turned into beautiful patterns if they’re accented and detailed just right? 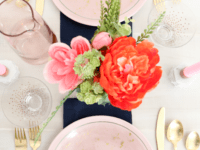 Do you love the idea of customizing your dishes to match on trend patterns that you’re seeing in the stores and all over fashion and décor? 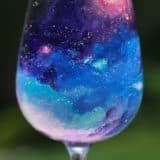 Then we’d be willing to bet that you’ll get a kick out of these stunning hand painted galaxy print wine glasses from Crafted Love! 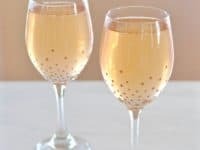 They show you how to sponge and speckle blues, pinks, and purples, as well as how to splatter and dot tiny white stars until your wine glasses look just like the milky way.